Every year, I try to get two holidays in with Spud, reflecting on my own childhood, where I had at least two holidays myself, I want my child to have the same that I had. Now my mum lives by the coast, we're lucky we're able to save a small fortune on accommodation by visiting her in the school summer holidays for at least a week, having a Cornish holiday, and getting to visit Spud's nanny/my mum, and Spud's auntie/my little sister at the same time. We do love our holidays in Cornwall, but we also love our breaks away at holiday sites such as Haven, so we try to go away to one of those at least once a year too. 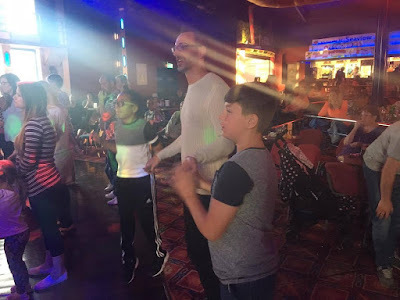 What we love about holiday sites is the entertainment and park facilities, I fondly remember me and my siblings dancing away to party songs and being called up on stage, and it's nice for Spud to do the same. My mums area in Cornwall has beaches, but they're not the same as beaches you can get in other area's like Weymouth. My mums area seems to be very surfer based, they don't have arcades, they don't have donkey rides, punch and judy shows and much more, so it's nice to get two different holidays in and let Spud see the difference, one is based on entertainment, whilst the other see's you making your own entertainment. Spud had an inset day on Thursday and Friday last week, so after school on Wednesday we headed off to Weymouth and spent a few days there until Sunday. 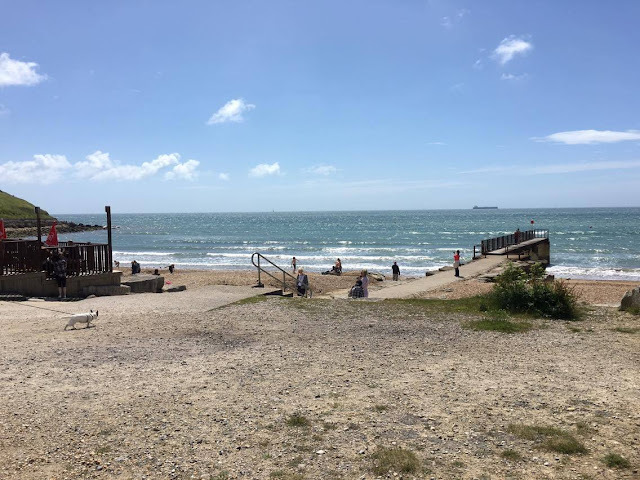 We left miserable weather in Reading and was greeted by sun in Weymouth, it was lovely to get away and as it was term time we was able to enjoy a break away at a much more affordable price, the inset days really did come in handy! When Spud was at school on Wednesday, I packed and got everything ready so it was a case of picking him up from school and setting off. As soon as we arrived in Weymouth, we went straight to Asda to stock up on some bits for the caravan, such as cereals, breakfast items, fruits, drinks etc. We try to eat lunch and dinner off site or at least out of the caravan, but luckily there's a shop on site which sells all the basics you may need, as well as there being two shops on the main road if we did want to eat lunch or dinner at the caravan. On the Wednesday we pretty much dropped off our shopping along with our luggage to the caravan and then headed straight to the entertainment complex in time for Spud to see the character show. We ordered dinner from the Papa John's on site, watched a little bit of the show and headed off to the caravan for a good night's sleep ready for a full day on Thursday. 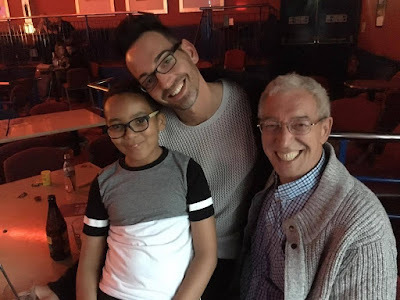 Spud, my dad (Spud's grandad) and my brother Paul (Spud's uncle). On Thursday, after breakfast, showering and getting dressed, we headed into the town centre which is also where the main part of the beach is! We had a look around a few shops, visiting the toy shop first on Spud's request where he spent some of his money on some new TY Beanie Boo animals, and then we headed off to the beach. We spent a few hours on the beach, but unfortunately it was a little breezy and the sand was being blown into our faces, but more so our eyes, something that's never welcomed! We crossed the road back into town and had some lunch, before a quick visit to the arcade, and then decided to go back to the site so we could go swimming. The site we was staying on (Seaview) has both an indoor and outdoor pool, and due to it being sunny but breezy outside, me, Gareth and Spud decided to go to the indoor pool, whilst other members of our family visited the outdoor pool, something I soon wished we'd done as they told us how lovely and warm the pool was, a difference to the cooler indoor pool we visited! We then headed back to the caravan, got ready and headed to the entertainment complex where we had dinner at the mini restaurant bar. The children's entertainment soon started and as usual my little man was down on the dancefloor getting involved! 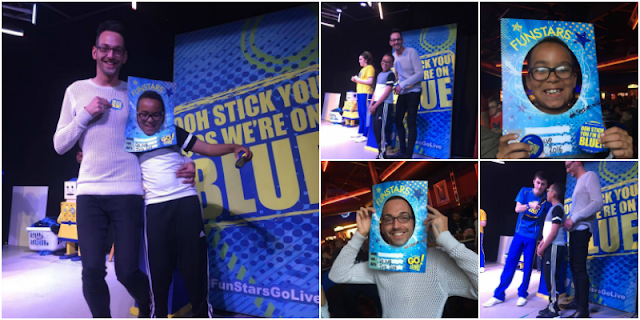 The FunStars GO Live really do get the children excited, especially when they say we have games coming up and we're looking for people to come up on stage for the chance to win! Spud soon grabbed his uncle Paul's hand and had him down on the dancefloor for a dance competition, and to no one's surprise, they was picked to go up on stage! Every year for the last five years, Spud has been picked to go on stage, so he's use to the attention being on him, and he's from a very big family so he's already got the competitiveness blood in him! Spud and Paul (my second eldest brother), had to compete against another child and adult, Spud had to guess what sports Paul was acting out, and then Paul had to have a dance competition with the other adult, it was safe to say Paul and Spud won, leaving the stage with lots of cheers, and a certificate, badge and sticker for Spud! It's these things that make my heart melt, Spud doesn't have much confidence, but when on holiday he leaves his worries at home. 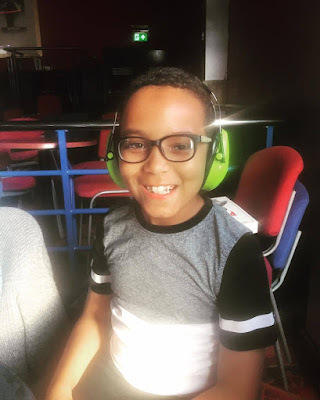 He does need his ear defenders once the children's entertainment is over and the family entertainment starts as it gets too loud for him in the complex, we've not been able to stay for any longer than 30 minutes due to the sound, but he always tries and for that, I'm the proudest mummy! The rest of our mini holiday see us visiting Bowleave Cove, an area situated at the top of a very big hill as Spud says, featuring a established small fair catering for younger children (no teenager onward rides), a large indoor play centre, a cafe, a restaurant and an arcade - which Spud wanted to visit every day due to it housing two Animal Kaiser machines! You pop a pound into the machine, play a game and get a Animal Kaiser card, Spud has over 30 cards now, and even gave some doubles away, so you can imagine how much money went into this machine from myself and other family members with four of the five children wanting to play it! We also got the children a wristband each which entitled them entry to the soft play house, and as many goes on the rides as they wanted, they had an hour in the soft play running around, whizzing down slides and having ball pit fights with one another! They went on all the fair rides along with the trampolines but soon got bored and wanted to go back to the Animal Kaiser machine! 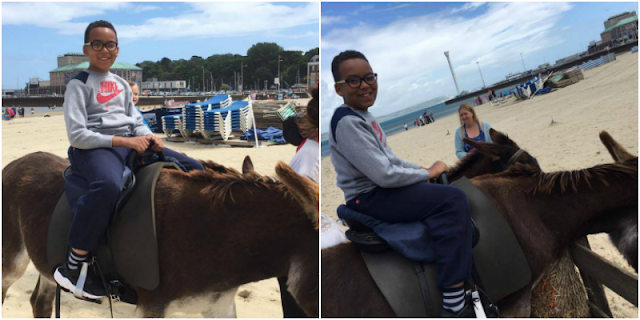 Other days see us spending more time on Weymouth's sandy beach, with Spud enjoying a donkey ride for the first time! I've lost count of the amount of ice cream and ice lollies that was purchased, and if I see pizza this week, I think I'll cry because of how much of it we seemed to of consumed! I wasn't feeling to great on the Saturday, so Gareth took Spud swimming for me when we arrived back at the caravan so I could have a nap. 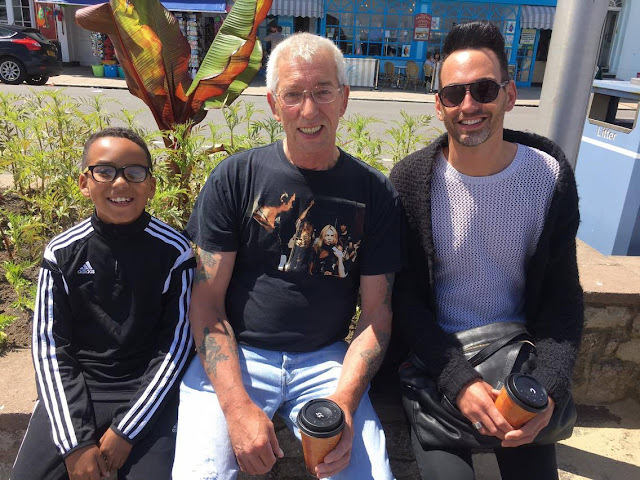 My dad (who we was sharing a caravan with), went off alone to Bowleaze Cove and Weymouth, reminiscing about the times and holidays he's spent their with his mum - my nan and Spud's great grandmother who we sadly lost a few years ago. Weymouth was her favourite place to visit, and through us all, the love carries on. Spud and Gareth arrived back at the caravan and Spud had been treated to a Greedy the Gorilla teddy along with a dinosaur costume for Greedy! A few of my siblings and inlaws had planned to go into town for the night, as my dad said he'd look after the five children, me and Gareth did originally plan to go but due to me feeling poorly we stayed in and had a night at the caravan alone as my dad had Spud and the other four with him at one of the other caravans. Sunday see us packing our bags and cleaning the caravan, but we wanted to make a day out of it and enjoy the lovely weather we had! We spent a bit of time at the beach, before taking a trip around the town where Spud got more items for himself, including a Skylander Light Trap which he has been after for a little while! Gareth also replaced my engagement ring after I sadly lost the stone out of it whilst Christmas shopping. Coming home wasn't disappointing as we got to see our puppy dog Jezeppi who we'd missed so very much. Gareth's parents had him for us, so he was in very safe hands, but we still missed our pooch, after all he's a big part of the family! He loved the presents we got him, and soon didn't want to know us, instead favouring his new toys! On Sunday evening, Spud and then Gareth started to feel poorly in the same way I did, I'm not sure if we'd picked up a bug or if it was something the three of us ate, we went from being really happy and positive knowing we'd just had a lovely mini holiday in the sunshine which seems to be a rare appearance for England nowadays, to feeling really rubbish and sorry for ourselves. 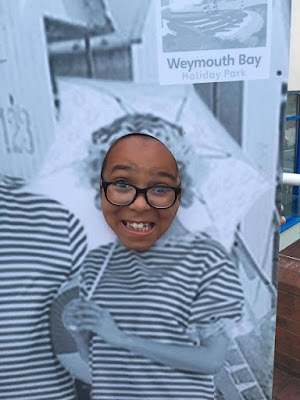 Spud couldn't attend school on Monday, but is now back to school and I'm sure telling all his friends and teachers about his holiday in Weymouth. When Spud's older, I'd love for him to read this post (if he wants to of course!) and be happy with remembering the memories from our first holiday of 2016!